How fit is Arkansas’s fiscal health? Where do Arkansas’s finances rank nationally? Olivia Gonzalez, a research associate for the State and Local Policy Project at the Mercatus Center at George Mason University, spoke Thursday, November 29th about Arkansas’s fiscal health and ranking in the COB Auditorium. 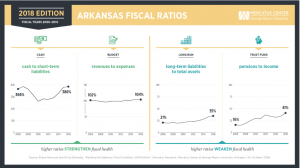 According to the Mercatus Center’s latest state fiscal rankings, Arkansas ranks 25th for fiscal health. Neighboring states that rank in the top five in fiscal health are Tennessee and Oklahoma. The study analyzes state finances on five dimensions, then combines them to produce an overall ranking. Cash solvency: Does a state have enough cash on hand to cover its short-term bills? Budget solvency: Can a state cover its fiscal year spending with revenues, or does it have a budget shortfall? Long-run solvency: Can a state meet its long-term spending commitments? Will there be enough money to cushion it from economic shocks or other long-term fiscal risks? Service-level solvency: How large a percentage of personal income are taxes, revenue, and spending? How much “fiscal slack” does a state have to increase spending if citizens demand more services? Trust fund solvency: How much debt does a state have? How large are its unfunded pension and healthcare liabilities? Gonzalez’s main suggestions were to improve Arkansas’s fiscal health by increasing Arkansas’s rainy day fund and making sure that Arkansas is planning for longer-term financial commitments like pensions and implementing tax reform correctly. UCA Assistant Professor of Economics and ACRE Scholar Jeremy Horpedahl and Nicole Kaeding, Director of Special Projects at the Tax Foundation, expand on this idea and more in a research paper Learning from Other States’ Successes and Failures in Tax Reform released in May, 2018. Horpedahl and Kaeding show that there are important lessons for Arkansas legislators to learn from other states and principalities when considering how to proceed on tax reform. Utah, Indiana, North Carolina and the District of Columbia implemented “smart, sensible” tax reform measures that can “dramatically improve competitiveness.” While the authors list multiple examples Arkansas should emulate, they also tell a cautionary tale about the “haphazard” tax reform efforts in Kansas mentioned by Gonzalez. Gonzalez recommended states treat their finances like like a budget-savvy individual would treat their personal finances. For more on this topic, visit our taxes and spending research page.